This room draws its name from the Austrian Countess who once owned the estate and added this chamber to the original building above the waterwheel, adjacent to the living room. 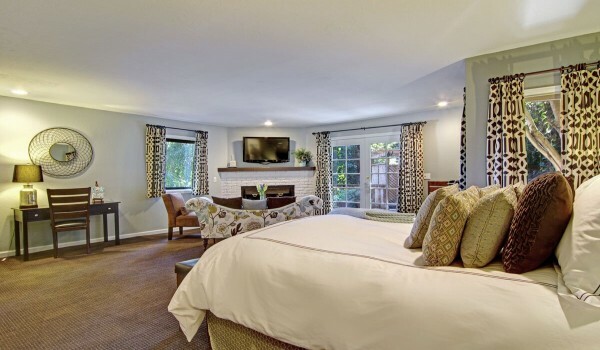 The Contessa features two queen size feather beds, a gas fireplace, easy chairs, books to browse, and large bathroom equipped with tub and shower combination. Contessa is situated closest to the street, so periodic street noise may be experienced. 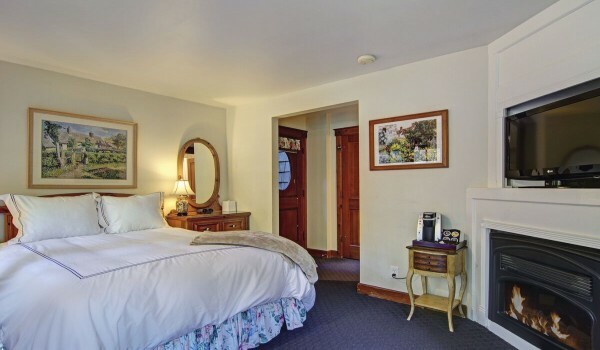 Renoir is our romantic downstairs chamber nestled in the heart of the Babbling Brook Inn and outfitted with a queen sized feather bed and a corner gas fireplace. 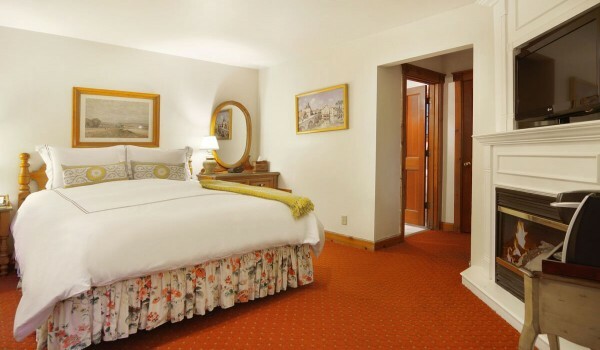 The walls are tastefully accented with the art of Renoir, and the private bathroom features a tub and shower combination. 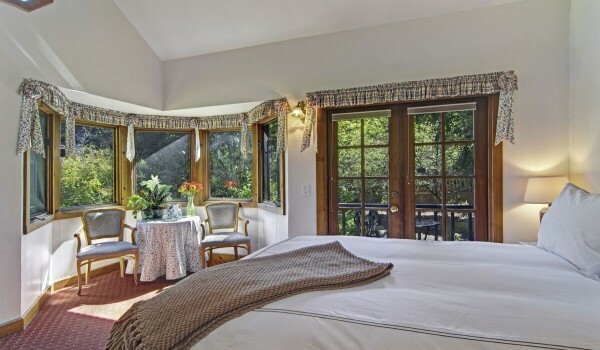 Relax by a roaring fire or enjoy the lush garden setting on the private deck with a view of the brook and garden gazebo. 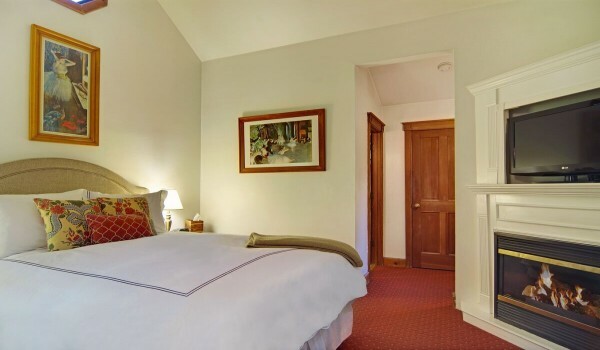 Sisley is our quaint downstairs room that is fitted with a queen sized feather bed, corner gas fireplace, and a private bathroom that features a one person tub and shower combination. Lounge alongside a roaring fire or enjoy the lush garden setting on the private deck with views of the babbling brook and garden gazebo. 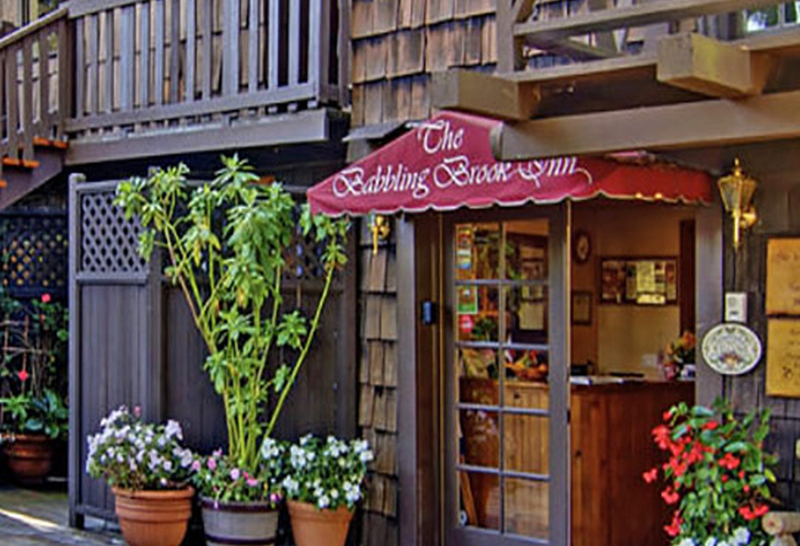 Degas is situated in the heart of the Babbling Brook Inn. 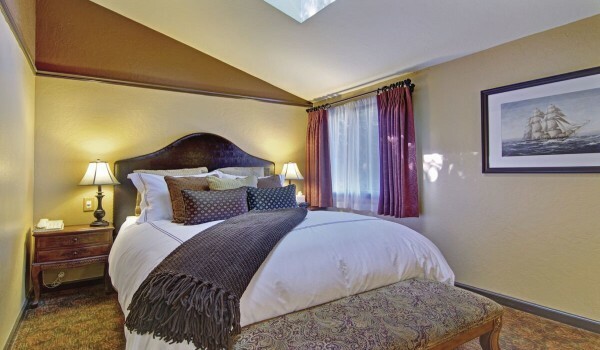 This upstairs room is a romantic escape featuring a queen sized feather bed, a corner gas fireplace, and a private bathroom equipped with a one person jetted tub and shower combination. Unwind beside a roaring fire or enjoy the lush garden setting on the private balcony overlooking the brook and garden gazebo. 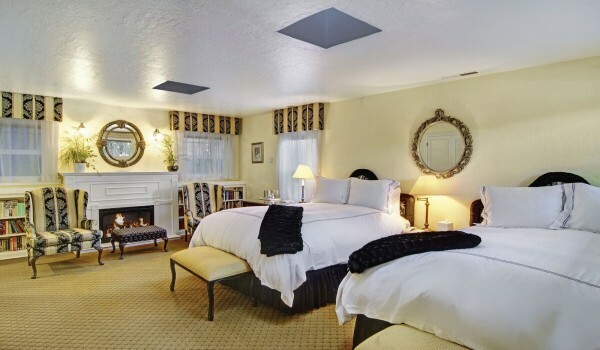 Our FMRS Garden room is steps from the lobby and features a king size feather bed, an electric fireplace, a writing desk, and a private bathroom featuring a two person jetted tub and shower combination. 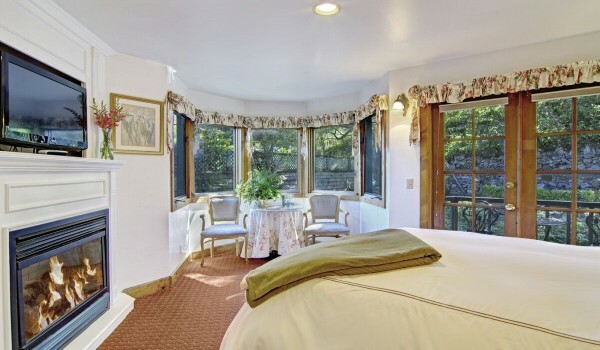 This room offers a beautiful view of the garden, gazebo, and brook. 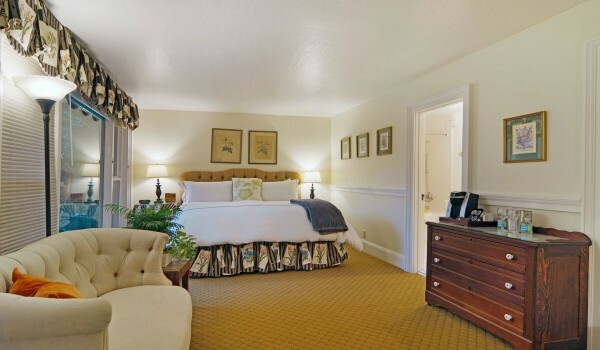 Monet is our impressive upstairs room with a queen size feather bed and views of the lush garden setting. 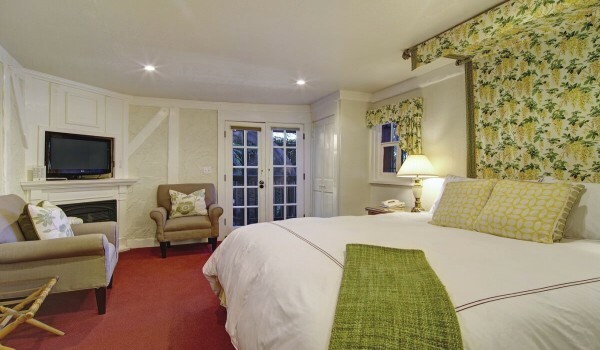 This room features one of Monet's loveliest prints, marvelous high open beam ceilings, a warm corner gas fireplace, and a private bathroom equipped with a two-person jetted tub. Monet's private balcony overlooks the garden and the brook as it flows away from the property. 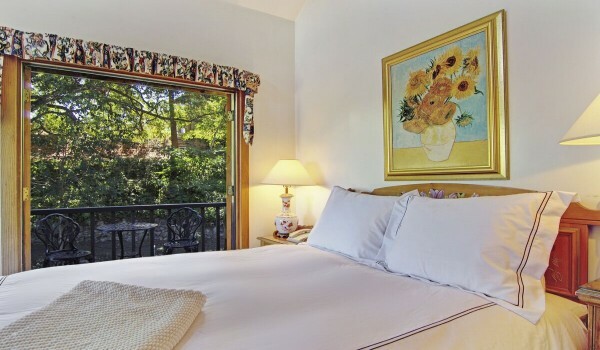 The Artist Retreat is spacious and private, perched upstairs with views of the garden and brook. 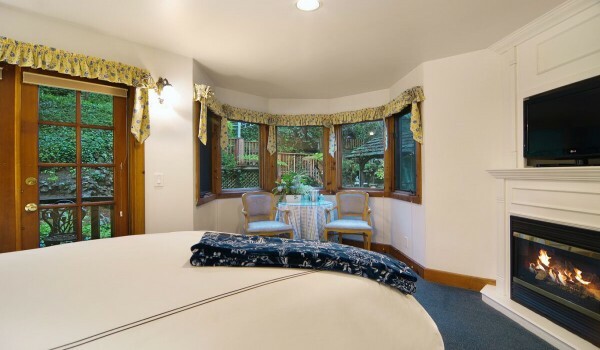 Enjoy a private two-person jetted tub on your large deck in this lush and romantic setting. 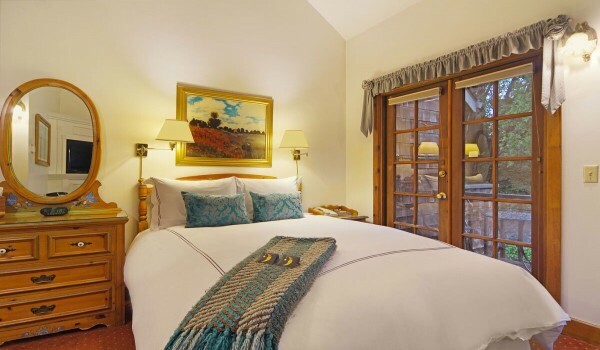 Cozily outfitted with a queen size feather bed, a corner brick fireplace, and a private bathroom that is equipped with a shower and skylight. This room may be combined with the Tennyson Suite.